This challenge is to create a layout that is patriotic (can be July 4th, Veteran's Day, Memorial Day, etc). 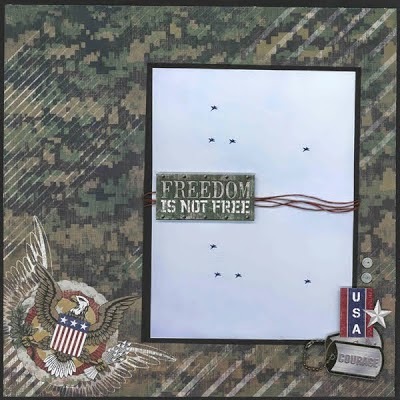 This incredible layout created by Carolyn, Scrapy Land DTM, was made using the Military line by Karen Foster Designs. I love how she used phrase "Freedom is not free" in her layout. Upload images in or group.